Here's stuff about my Citicar electric car. See the picture link for details on the parts that make up this car. History: These were built in the mid 70's through the early 80's under the Citicar & Comutacar model names. It is an all electric car that can go about 40 MPH with a range of around 30 miles. Power comes from 8 - 6 volt deep cycle batteries. It is fully street legal, has wipers, heater, head and tail lights, signal lights, speedometer, radio, lap & shoulder seat belts, everything you see in a regular car. Ideally it is an in-town commuter car. I live 3 miles from work, the road is relatively flat and the top speed limit is 35 which is ideal for the Citicar. At work we have power poles for plugging in car block heaters which will work great for recharging the Citi when I'm at work. My dad bought the car at the estate sale of an old friend. It had been sitting for many years in a dirt floor barn, so the entire undercarriage had to be restored. The car had around 1000 miles on it. It had been sold in Iowa, had a stay in South Dakota and ended up in Minnesota. I live in South Dakota and when we registered it for licence, it actually came up on the SD DMV registry as having been titled in SD before. I've restored and improved the Citi so I can use it around town. Fun eh! For more information, see the Yahoo C-Car group. This group has been a huge help in getting my car to the state it is in. I'm a hot rodder by nature, so I couldn't leave well enough alone. The original electric drive motor had been corroded badly sitting in the shed and was not readily repairable. 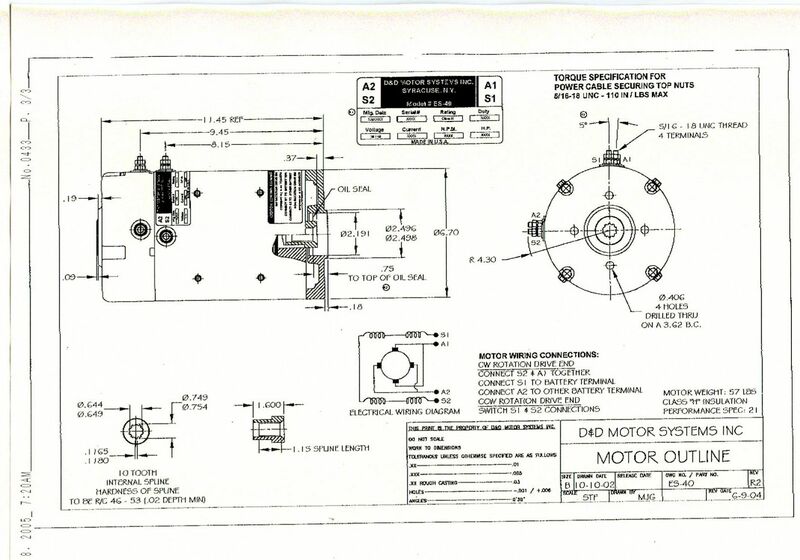 What I did was order a new motor from D&D Motor Systems in Syracuse, NY - model ES40MOD - to replace the original. This motor has about 150% of the power (9hp - vs - 6hp) as the stock unit and was custom wound to run on 72 volts. The car originally ran on 48 volts, but by stepping up to 72 volts I'll be able to get more speed and range. I've utilized the original motor cooling fan to help cool the new motor for longer life. To acheive the 72 volts I'm using 6-12 volt deep cycle Trojan "industrial" batteries. 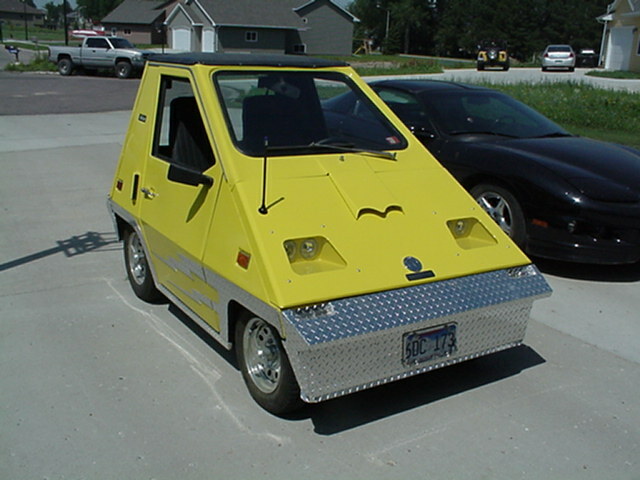 In it's original configuration the Citicar had its 8 - 6 volt batteries under the seat. The 6 and 12 volt deep cycle batteries are very similar in size. I placed the 6-12 volt batteries under the seat in the same trays where the 6 volt batteries had been located. This brought me to the desired 72 volts. With the voltage changed, the original charger would no longer cover the charging needs of the car. I purchased a new charger from Electro Craft (www.evcraft.com) in Toronto, Ontario, Canada. The charger is an on-board isolated switch-mode "inteligent" charger with 4 stage charging. The charger is mounted in the location of the original charger inside of the car, on the floor, just above the front axel. I had to build a custom aluminum bracket to hold it. The cooling fan for the charger has been directed to the outside to keep the car's cab cool when parked and charging. I also installed a Sevcon 622/11086 DC/DC converter under the charger to convert the 72 volts to 13.5 volts to run accessories. I have an axilliary 12 volt battery in this same system for additional "low" voltage storage. With the motor and voltage change, I also upgraded the motor drive controls. The Citi originally came with a 3 stage (read this 3 speed) relay speed controller along with a reversing relay for backing up. I replaced the 3 stage relay with a Altrax AXE 7245 DC drive controller at 12-72 volts, 450 Amps. This is the more modern control method for DC motors in electric vehicles. The AXE controller provides infinite speed control, better current management and is easier on all of the drive components. The controller was mounted in an aluminum control box with heat sinks attached on the outside for cooling. The stock reversing relay was replaced with and Albright 202B 12 volt reversing contactor. A Tyco LEV200 series contactor was used for the primary drive start contactor. The contactors are in the control box with the AXE and has vent fans to keep it all cool. With all of this extra power, it was best to improve the original AGW4 battery cables to something more substantial. All primary power wires were re-sized to 00 welding cable. Doing so reduces electrical resistance losses which will improve speed and range. It is also safer due to reduced power wire cable temperatures. The original Citi throttle was a series of micro-switches that activated the stages of the relay motor controller. With the new Curtis drive controller, a potentiometer type throttle is needed. For this I used a Curtis PB-6 pot box which has a 0-5 K-ohm output to match the controller's input. It also has a microswitch which is used to close the primary contactor when the throttle is depressed. The combination of the AXE controller and pot box provides infinite speed control. This makes the Citi feel more like a car with automatic transmission. Overall, a very smooth acceleration. With the drivetrain and chassis squared away, I then turned to the body, accessories, trim and interior. Starting with the exterior, I removed all of the trim, stripped and sanded the body with Scotchbrite to prep the surface. A coat of epoxy primer followed by 3 coats of '76 Corvette yellow and a clear coat were applied. I want to be seen for safety - and showing off. I Then built custom "aero" bumpers for the front and rear using 1/16" aluminum diamond plate. I tried to pick up on the styling theme of the Citi II concept car that was inteded to replace the Citi, but was never built. The front bumper has a latch and pivots up for access to the front suspension. From the same 1/16" diamond plate I made wheel well surrounds and lightning bolts for the doors to add some styling to the car. Aluminum diamond plate was also used to make lightning cloud decorations, headlight surrounds, door panel interior cover plates and other decorative and functional items for the car. Since I intended this to be a fun car I pimped it out in the MTV "Pimp My Ride" fashion. I installed a stereo system with amplifier, sub woofer box, multiple speakers, all with lots of power. I added and under car LED light system that glows blue, a lit blue tipped radio antenna, the windsheild washer sprayer was converted to electric with a spray head that is a chrome skull with blue lit LED eyes. Other fun things were added too like glow-in-the-dark ailen sticker, "Lightnin" badge, chrome skull licence frame, chrome skull tire caps, Chrome "fuel" fill (with electrical plug inside) etc. Lastly, I added a set of cool chromed wheels with radial tires to make it stand out. The car drives very well, is quick and has a top speed of around 50. It looks sharp and catches many eyes. Most of all it was fun to fix up, learn all about electric cars and visit with other car owners. I'll likely build another electric - but that one will be a real street rod with a performance electric drive system.